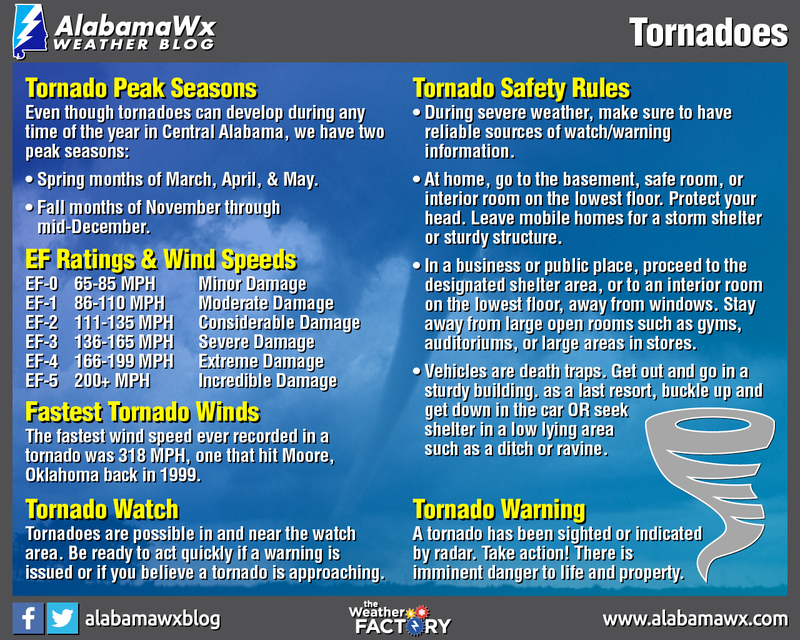 Living in Central Alabama, you really need no introduction to tornadoes. A tornado is a violently rotating column of air usually descending from thunderstorms that makes contact with the ground. Wind speeds with a tornado can be as week as 65 MPH, but can reach upwards of 200 MPH and beyond. The fastest wind speed ever recorded in a tornado was 318 MPH, one that hit Moore Oklahoma back in 1999. 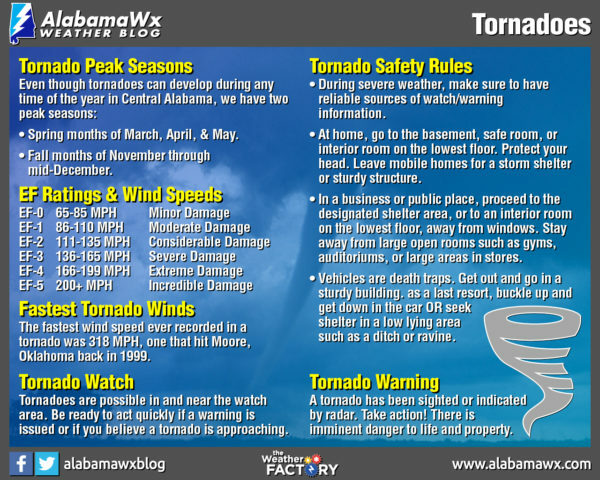 Even though tornadoes can develop during any time of the year in Central Alabama, we have two peak seasons: the spring months of March through May, and the fall months of November through mid-December. Tornadoes come in all shapes and sizes, but most of the time in Alabama, they are usually hard to see because they are rain-wrapped or hidden by the terrain. This makes them very dangerous. Your safety depends on being constantly aware during severe weather events. A Tornado Watch means that tornadoes are possible in and near the watch area. Be ready to act quickly if a warning is issued or if you believe a tornado is approaching. A Tornado Warning means a tornado has been sighted or indicated by radar. Take action! There is imminent danger to life and property. Tornado watches are issued by the Storm Prediction Center. The area of a watch is typically large, covering numerous counties or even states. Warnings are issued by your local forecast office. Warnings encompass a much smaller area, usually including parts of parts of a few counties at most. Warnings are issued when a tornado is observed by a person on there are definite signs on radar. Be prepared! Acting quickly is key to minimizing impacts and staying safe. Stay Weather Aware: During a severe weather threat, pay close attention to your reliable sources of watches and warnings and be ready to act in case a warning is issued. In Your Home: If a tornado warning is issued for your location, go to your basement, safe room, or an interior room on the lowest floor, away from windows. Get under something sturdy. Put on a helmet if possible. At Work or School: Proceed to the designated shelter area. Stay away from windows and do not go to large open rooms such as auditoriums, cafeterias, or gymnasiums. Outdoors: Seek shelter inside a sturdy building immediately. Sheds and storage facilities are not safe. In A Vehicle: You are not safe at all inside a vehicle during a tornado. Drive to the substantial structure and go inside. If one is not available, stay in the car, buckle up and get down OR seek shelter in a low lying area such as a ditch or ravine. For more detailed information, review our severe weather safety tips. It’s very important to have a personal severe weather safety plan for you and your family. Stay Informed: Continue to listen to local television or radio coverage or NOAA Weather Radio to stay updated about tornado watches and warnings. Multiple rounds of thunderstorms capable of producing tornadoes are possible during severe weather outbreaks. Contact Family and Loved Ones: Let your family and close friends know that you’re okay so they can help spread the word. Text messages or social media are more reliable forms of communication than phone calls. Don’t disregard severe thunderstorm warnings because severe thunderstorms can produce tornadoes with little or no advance notice.